Have you ever tried putting together a puzzle without knowing the final image? It’s difficult to know where all the pieces go because you don’t know what you’re working towards. Your life can be similar. If you don’t know who you are meant to be, what your life is meant to be, it can be difficult to put the pieces of your life together in a meaningful way. You might piece together only the outside edge. You may find yourself doing the easy things, creating a superficial life, that is either empty or messy inside. You might try putting pieces together based on some other image. You may compare your life to the people around you and grow dissatisfied because they have pieces that you don’t. You might try forcing pieces together. You may find yourself living inauthentically, trying to be something you’re not. Eventually, the pieces won’t hold together. You may not enjoy your time spent putting the puzzle together. You might be trying to get to some destination or goal, believing you’ll only be happy when all the pieces fall into place. How do you know what image your puzzle is meant to become? What are you working toward? That’s the image on your box of puzzle pieces. That’s what you’re working toward. It’s in the context of the best version of yourself that all your puzzle pieces make sense. When you have the image of the best version of yourself, you won’t just do what’s easy, you’ll do what’s right. When you hold to the best version of yourself, you won’t get distracted being a version of someone else. When you are the best version of yourself, you’ll live authentically, fully, and sustainably. Being the best version of yourself isn’t a goal or a destination, it’s a process. Like the puzzle, life is a process. It’s not about the final image, but about the putting it together, the living. Who is the best version of yourself? 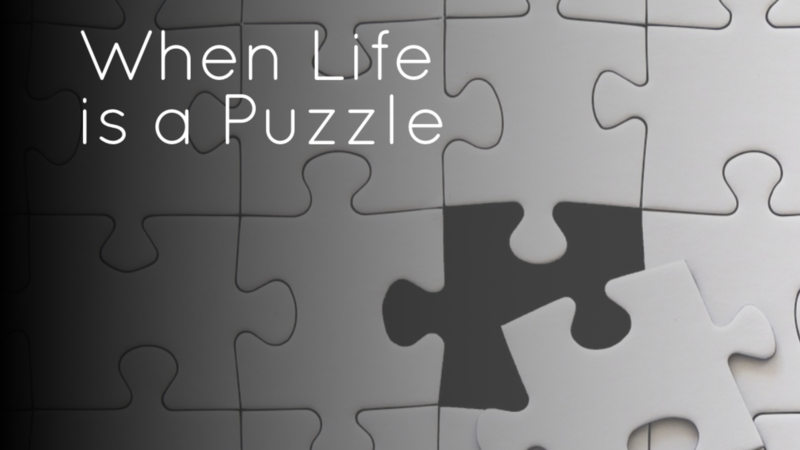 Do all the puzzle pieces of your life make sense in the context of the best version of yourself? Sign up to receive inspiration, skills, tools, and tough love right in your inbox each week. Don't worry, we won't share your email address and we're not going to fill up your inbox with junk. Stay connected. Get the stuff you need, right in your inbox!